As I have mentioned in the preview review, the schedule on Sunday was the toughest amongst the three days- many good bands were overlapping each other on the schedule. I guess there are always pros and cons for having such a big music festival in the park. One of the downsides was that it takes for a while to go back and forth between two biggest stages; one is located on the northeast side, and the other is located on the southeast side, which makes sense due to the sound quality of both shows. However, this fact made it so hard to check shows from both sides. I had such a hard time trying to decide! My initial plan was to check Mutemath – and to get right up front. I didn’t really care how long the wait would be. I always wanted to see the band in the front. So I planed to be the south side fairly early. However, there was a band that I definitely wanted to check – a Visual Kei band (the closest similar description I can give is epic Goth Metal with big guitar solos and sing-along Choruses) from Japan. This was their first North American show after decades of playing in Japan, Europe, and Asia. I grew up listening to X Japan. Influenced by my best friends’ sister, I always embraced their music. I still recall a day that my dad got me their best album just to talk to me when I was in grade 8. (I was a typical Japanese school girl, who didn’t get along with daddy.) I was so happy that I had a long conversation with my dad how good their songs sounded. I also remember the day when the lead guitarist, hide (pronounced “he day”), committed suicide. (There is a whole discussion of whether or not it was an accident or suicide, but we won’t get into that here) I do remember how shocked I felt. I especially liked him the best due to not only his outstanding performance on the stage, but also his warm personality and funky hair colour. He was well known for his caring character among his fellow musicians. I recall the X Japan’s performance of “Forever Love” at his funeral. As enough said about my nostalgic memory about the band, I decided to run through the stage to another. So here was my final plan. After checking Minus the Bear, go to see X Japan for 30 minuites and run over to the southeast stage to check out Mutemath on time. My friend Saira and I ran to the stage very quickly after the Minus the bear. We even left two other people behind just to catch up with the opening of the band. 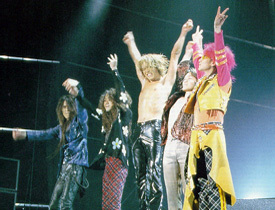 With such an excitement, X Japan commenced their very first show in North America with the brief intro of Amethyst. Then they warmed up the stage with songs including Jade and Rusty Nail. Although I was extremely happy to see their performance, I occurred to me that the band was struggling to get the crowd moving. I don’t think their North American Debut should have been a festival like Lolla – not too many audience members at an alternative music festival would appreciate this kind of dramatic music. The crowd is more into indie alternative/rock music. It was really obvious by when they played “X”. This song is one of their most well known among fans. When the band plays the song everyone in the crowed sings along with the lead singer Toshi. With the Lolla audience, Toshi was screaming and telling them to sing along.When I left the stage to catch up with Mutemath starting shortly after, I heard that Toshi was yelling at the crowed in Japanese to sing along louder. I doubt not lots of people understood what he said, but it just showed how frustrated he was. Despite the struggle, I was still happy to see X Japan and especially when they played the song “Jade”, hide appeared in the screen playing the intro. I felt tears filling up my eyes and so did for lots of people. I wish I was able to see them play the last song, “Tears” as it is one of my favourite songs! I would love to see them headlining for their own tour in North America. Then they would receive the warm response they deserve!